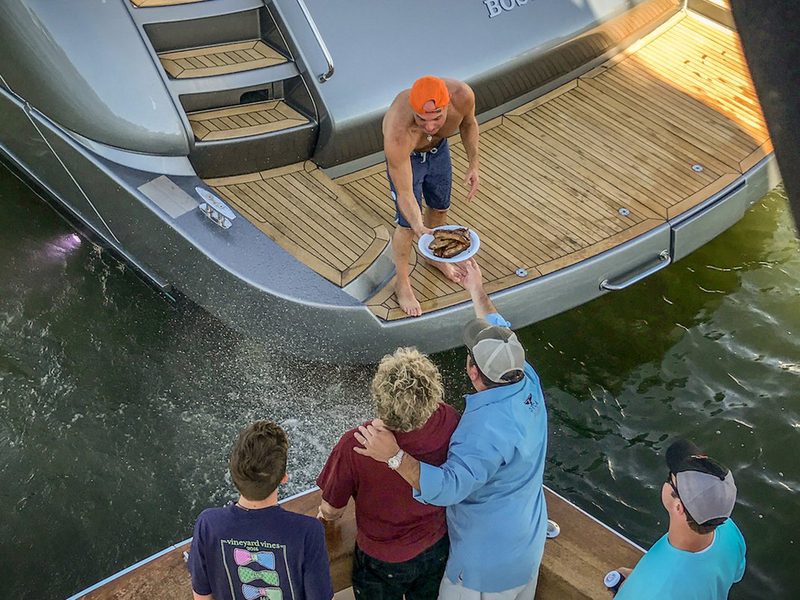 While rocker Sammy Hagar and celebrity chef Emeril Lagasse were cruising the high seas off the coast of Fort Lauderdale, Fla., on Saturday (Feb. 11) during Emeril’s inaugural charity fishing tournament, they happened upon Kenny Chesney on a multi-million-dollar Riva Virtus yacht. According to a post on Sammy’s website, it was an opportunity the Red Rocker couldn’t pass up. An hour into the boat ride we saw this big gorgeous gunmetal gray 86ft Riva with a few beautiful people on it—I looked closer and noticed it was Kenny Chesney! I screamed at him and he stopped, backed up, and we had a couple high-fives, a toast, and Emeril handed over to Kenny a big plate of barbecue ribs and a jar of about a half pound of beautiful caviar—can you believe this sh*t!? We said goodbye and then Kenny showed up at the event later that night at the Marina Club House, and jumped on stage to sing a really soft version of “Eagles Fly.” Vic and I played an acoustic set for over an hour, and Kari joined in for “One Sip,” “When the Sun Don’t Shine,” and “All We Need Is An Island”—it was an unbelievably satisfying and successful event! Afterwards, Kenny hung out and we polished off a couple bottles of Da’ kine, what a night! According to Forbes, Kenny raked in around $56 million last year, so he can afford a nice vacation.